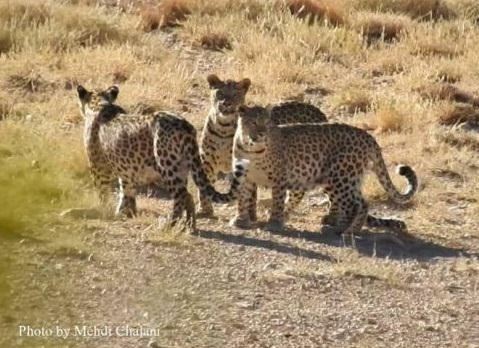 Persian leopards in Semnan province, north-central Iran. 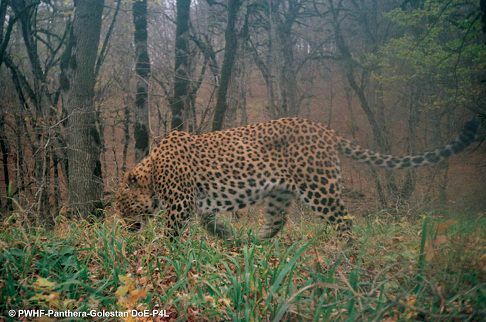 These leopards are still considered to be cubs .. or perhaps "teenagers"
A Persian leopard in the forests of Golestan province, northern Iran. I never knew there were still that many of them in northern Iran. In the list of endangered species, Persian leopards are carefully nurtured by the province's Environmental Protection Department in protected areas with high security. An estimated 550 to 850 Persian leopards are left in the world, all in northern Iran, where they roam throughout the mountain ranges and forests up to the Caspian sea. Environmentalists are working hard protecting them from poachers, expanding population, encroaching livestock of farmers and busy highways (they often get hit by cars and trucks) that destroy their natural habitats. These big cats are killers too; they frequently attack the livestock of farmers and villagers in northern Iran. Angry farmers often poison the carcass of the animal the big cats 'dine' upon. The environmentalists are trying to discourage the practice, however the annoyance of the shepherds is understandable too. Since 2016, rural residents and farmers across Iran have been given insurance coverage against loss inflicted by these nice-looking but terribly dangerous cats. In the middle ages Persian leopards roamed far into the Caucasus Mountains in central Asia, including Armenia, Azerbeijan and Georgia. Now they are concentrated only in Iran which scientists say "is their best chance for survival." O really!? leopards in Iran .... I never knew at all. And if those ones are still "cubs," how huge will they get when they're adults? I can understand Iran's interest in protecting them ... but predating animals aren't my piece of cake ... even though the big cats look elegant no doubt. Yeah that's true sis. I too never want to watch those predating scenes in wildlife docs showing big cats killing weaker animals for food ... though without that the predating cats will starve cause they eat nothing except other animals. Nonetheless, I hate to see one animal killing another. Not to mention, still worse, humans are just as much a 'delicacy' for these big catos.